Based on Chimamanda Ngozi Achibe’s novel, Half of a Yellow Sun takes place in the late sixties and tells the stories of two sisters, Olanna and Kainene, during the time of the Nigerian-Biafran War. Olanna falls in love with a man named Odenigbo who is a revolutionary man and Kainene begins a relationship with a British man who came to Nigeria to teach. While Olanna goes against her family to be with Odenigbo, this revolutionist has a hard time doing the same. His mother tries to separate Olanna and Odenigbo and one night when he was drunk he had an affair with the maid. The maid becomes pregnant and this is especially hard for Olanna since she can’t have children. Olanna has an affair with her sister’s boyfriend and before the wounds can heal, the political state of the country takes the focus of the group. The southerners declare independence and mass violence has forced the family to move from their homes in the north. The second half of the movie focuses on war and how it affected civilians on a day-to-day basis. 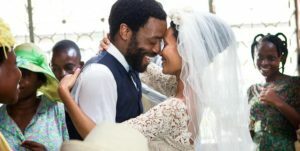 Evacuations, shootings, and starvation are the harsh reality of the time period and not even the wedding of Olanna and Odenigbo escapes the consequences of war.Major themes of the movie are tensions in class and how relationships transitioned throughout the time of war. The movie portrays the environment that each sister lives in, due to each one’s choice of lifestyle. Olanna accepts Odenigbo’s daughter as her own and learns to live in poverty. Kainene switches gears from working for her father and taking charge of a large company to managing a refugee camp.